(Newser) – It's only halfway through the year and there have already been more than 2,000 shooting victims in Chicago, far more than recorded in the city this time last year—and far more casualties than the US suffered in the Gulf War. The milestone was passed over the Fourth of July weekend, when police say four people were killed and at least 46 injured in 42 shootings and one stabbing, reports CNN, which describes the mayhem as a "war among criminals" that has caught many innocent people in the crossfire. Police say there have been 319 murders in Chicago so far in 2016, around 50% more than at this time last year. There were 2,988 shooting victims in the city in the whole of 2015. It's amazing that every time we have a white shooter mass murder Obama gets on his high horse and starts preaching about taking guns away from law abiding citizens, yet he says nothing about thousands of minority shootings with illegal guns. Wouldn't he do more good by going to Chicago and preaching to the morons who actually voted for him?? This is exactly why law abiding citizens feel the need to protect themselves! get the good folks outta chicago for the weekend and have a "purge"
Yet Democrats want to illegally and violently steal my weapons rendering me helpless, using my own Tax dollars to do it. 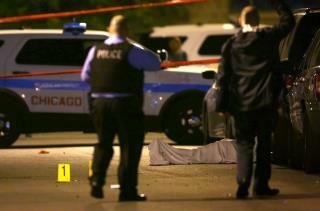 In Chicago everyone able should be forced to carry a gun, by law. Politeness would quickly ensue. Liberalism is a cult whose mysticism transcends reason.